Gone are the days when the bride would simply sit in one corner waiting for her bridal mehndi design to get completed and watch others have fun. Today, this is the period when the bride enjoys a fun time and relaxes with her friends, family and relatives. 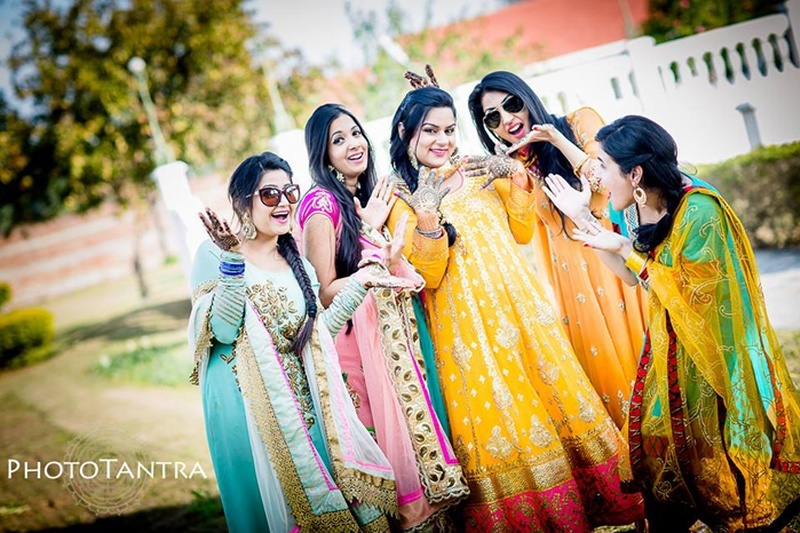 Mehndi ki raat is quite similar to a bridal shower or hen’s night in the West. With mehndi ceremonies being celebrated lavishly, we’ve got some creative and fun-filled suggestions you could indulge in while getting your stunning mehndi done. Have your best friends or family put up a skit or dance performance to keep you and the guests entertained. The skit or dance performance can be anything related to the bride and groom. It could be based on how they first met; their first date, any funny incident or most cherished moment till date. These are just a few examples; we are sure you know your family better than we can imagine. Get witty! A bridal mehndi design is more intricate and exquisite compared to the rest. While yours will take hours to complete, considering your mehndi design for full hands and legs, your friends and relatives will obviously get done with theirs design sooner. To make things interesting, surprise your guests with the best mehndi design honour. You simply got to look at all the beautiful designs on their hands and select the one you loved the most. Don’t be biased towards your favourite chachi, maasi or best pal. Have fun! Introduce the fun and trendy element of karaoke in your ceremony. You can either choose to sing the first song or have the elderly to do so. This is the time you can watch all the self-proclaimed singers mix up the lyrics, your aunties and uncles turn into rock stars and let’s not forget the young megastars in the family awaiting to stun the audience. Get all the mehndi song lyrics going for this one and sing along. With all the bustling entertainment, you won’t even realise when you got done with your gorgeous mehndi design. So, join your guests for the remaining fun and frolic. Dance to your favourite tunes, it’s your day! Firstly, before you get started with your mehndi designs, ensure you’ve eaten well. You don’t want to lose out on all your energy when the party has just got started. Lastly, don’t forget to keep the quirky poses coming. Remember, this day will never return. Don’t stay shy, be yourself and let loose.